One of the things we do exceptionally well at Dreams Unleashed is bring women together in the context of small group community to champion, challenge and facilitate life change in their personal and professional goals and dreams. 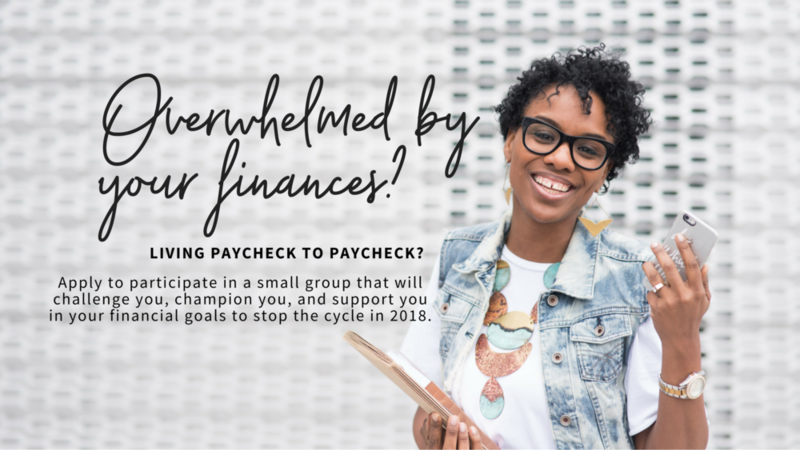 This year, we want to apply this dynamic to one of the major dream hurdles that keeps women from fully walking out their God-given dreams: FINANCIAL OVERWHELM. When your finances aren't together, it's almost impossible to think about confidently living out your God-given dreams because you're always waiting for the other shoe to drop. You know WHAT to do but you just can't seem to stay on track with your money goals. Perhaps you've read a dozen financial books and you've taken all the money classes that have come your way. At Dreams Unleashed, we believe that more often than not MORE INFORMATION is not what you need, instead it's accountABILITY that's most needed to get you on track and keep you there. Join us for this 3-month pilot program as you meet with your small group virtually (or in-person if you're local to Lanham, MD) to discuss your money goals, bi-weekly check-in, and via our on-going chat platform between meetings. In our first session, you'll meet the ladies within your small group co-hort as each person shares their money story and the vision for where they'd really like to be. In the second session, we'll create and commit to SMART (Specific, Measurable, Attainable, Realistic, and Time-Bound) goals to set you up to win in your finances. While it's a pilot program, we have to make sure you have some skin in the game to build consistency. After being accepted into the co-hort, you will receive the proposal/contract and invoice to participate. Both items submitted within the provided timeframe will guarantee your spot. I'm living Paycheck to Paycheck, where will I get $300 from? Girl...if you're anything like me, when you need it, you know how to switch things around to make it happen. Perhaps it's foregoing a couple runs to our fave store with the dog with the red circle around his eye. Or maybe it's letting go of that mani/pedi for the next few months. Here's the thing....you're a brilliant woman; I know you have the capacity to figure it out. AND by participating in this one-time, you're saving somewhere around $700 or more from when the actual program rolls out. If you need to break this up into two payments, just let me know and we've got you! This is truly a SMALL GROUP which means there will be limited space. You can participate virtually or in-person.To apply, please complete the below form. No money is due until you are actually accepted to participate in the program.